HEAV, Richmond and new designs! I'd like to take this opportunity to thank you for your interest in my business, 'Doll Clothes of Yore', and also to apologize for the lack of variety in my website catalog of late. 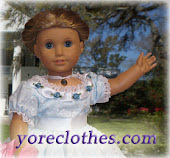 I took 'Doll Clothes of Yore' to an annual convention in early June, and completely sold most of my designs. I am working hard on some wonderful new styles, and I am excited to be releasing them soon. It is slow in coming due to backorders from the HEAV convention in Richmond VA, a weekend loss of electricity, and general busy-ness! It is my goal to release my Summer 2013 Collection in time for Independence Day (July 4th). My July 2013 Dress will come shortly afterwards. Here's a sneak peek at my Summer Collection! A Colonial Wedding Dress - inspired by the wedding dress of Martha Washington! 1950's Poodle Skirt outfit - So adorable! I'm excited about my new designs and I hope you are too! I think they will be worth the wait! Stay Tuned!